Happy Thanksgiving everyone! Hopefully at some point today you will have eaten so much that you hate yourself. Two topics I want to hit on before I dive into Turkey Day Precap: Ryan Mallett and RGIII. First of all, I really like RGIII. I loved watching him in college and his rookie year was incredible. Many people predicted he would be a better player to build around than Andrew Luck. My, how things have changed. He has fallen from grace mightily and it makes me quite sad. He is a talented guy that injury has seemed to ruin, or the league has figured out how to defend, or something. It has gotten so bad that he has been benched in favor of COLT MCCOY. I hope that he can find his way out of the dumpster fire that is Washington (I refuse to use the name Redskins–oh crap I just did, what have I done?) and get back to his winning ways elsewhere. And now for the saddest news of all: Ryan Mallett has past. I will always remember you for your stellar deep-balls and your ability to narrowly avoid interceptions with your inaccuracy. I loved the time you spent in the starting role, however short. These were my favorite weeks of the year. I am in mourning and look forward to the day when I see your name in the Hall of Fame. Until then, get well my friend. Oh, wait that’s not the Falcon’s, its just something I’d rather watch than Mike Smith’s miserable clock management. This should completely drive the nail in Mike Smith’s coffin. His clock management has been a nightmare all along, but it was so bad that even he said it was bad. If you’ll remember, Mike Smith never says anything of value in his press conferences, promises changes, and does the same thing week in and week out. Smith directly put the Browns in a position to win the game this week with his boneheaded timeout and the writing is now officially on the wall for our platinum-haired friend. Our defense gets a boost this week as one of the best players on that side of the ball will return in William Moore. WillyMo is my favorite player/rapper and I am very glad to see him return to action. I can’t wait to see him and Spoon healthy together once more. Hello, 2015, we are hoping and praying that you will put us out of our misery. The Falcons are still very much alive in the playoff race, because that makes perfect sense. I just know that this season is going to end with us in the playoffs and having to settle for a #20 pick rather than a top 10 pick in this year’s draft. Because, why not cap a terrible season with a terrible draft pick? I am not optimistic about the future of this program at the current moment. I hope Arthur Blank can change my mind during the offseason. Newcomers: Seattle sure didn’t stay out of the playoff predictions for long. Defeating the team with the best record in the league will do that for you, though. The Lions get the boot this week as they are now not playing the best football and someone had to fall out. The rest stayed the same although it seems like every team in the AFC has a 7-4 record. Super Bowl Pick: New England still looks like the best team in the nation (because the football gods hate everyone) and Arizona seems to be largely hindered by having Drew Stanton at the helm. Therefore, New England stays and Arizona gets bumped out by a team that is hotter than a dancing bobcat: the Packers. 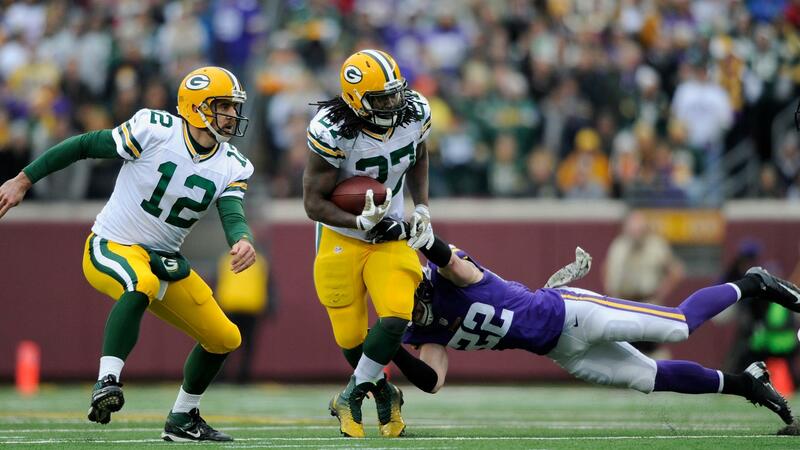 Eddie Lacy has remembered how to do his job, the defense is playing surprisingly well, and Aaron Rodgers has returned to form. All of these are good signs for a team that likes to get hot late in the season and make a run in the playoffs. My pick: Green Bay vs. New England. All other GIFs seemed so weak in comparison to what may be the best catch of all time. He deserves all three spots. Marquette’s team finally won this week. This is not ideal for him s when his team plays better, he punts less. Fortunately for us, he is still on pace for 102 punts. Here’s to hoping we can up that projection here with some terrible play by the Raiders! 1. Aaron Rodgers throws for 3 TDs against the Pats. 3. Le’Veon bell gashes the Saints for 150 yard on the ground. I hope everyone has an incredible Thanksgiving and enjoys a day full of eating and couch-potatoing as all good Americans do.